We are always on the lookout for talented new vestment makers who have a love for the sacred liturgy. The chasuble shown here was made by Adam Bławat of the Polish vestment company Benedicamus. A keen medievalist, he specialises in the re-creation of historical vestments using textiles based on historical designs. Thanks to a benefaction, I commissioned this red chasuble, and the design was suggested by Adam who worked closely in consultation with me. The inspiration for this chasuble was a German brass memorial from 1340, shown here. The original is clearly a conical vestment. However, out of consideration that the chasuble will be worn by different priests in our Dominican community, I decided that a conical vestment would be too awkward. Adam came up with a good solution. The cut of the chasuble is quite unique, like a full Gothic which mimics the folds and fullness of the conical form without encumbering the hands too much. The historical brocade that was chosen matches very closely the brass memorial. The textile, fashioned from woven silk, is a replica of the brocade of the chasuble of Pope Boniface VIII (d.1303). The double-headed eagle on the design of this textile indicates that it was probably a cloth of imperial Byzantine origin; the gryphon is a symbol of the two natures of Christ; the birds, which echo a design on my ordination chasuble, is a symbol of souls in heaven, or perched on the Tree of Life. The chasuble was originally intended to be used on the feast of Saints Peter and Paul, but the delivery took longer than anticipated. 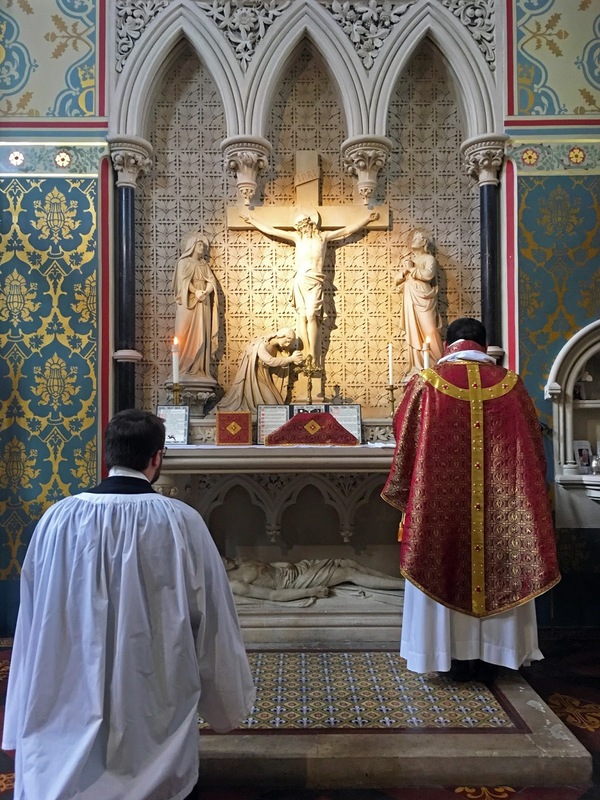 Hence it was used for the first time in a Dominican rite Mass on the feast of the Most Precious Blood of Jesus (1 July). The orphrey of the chasuble is studded with coral flowers, and I discovered subsequently that the Native Americans regard coral as a symbol of blood. How very providential! The pearls, also on the orphrey, are a symbol of divine truth or wisdom and, indeed, of the Kingdom of heaven. The vestment set is complemented with an apparelled amice. Therefore this chasuble points to the Blood of Christ the God-Man, that was shed for our salvation – a divine truth that is like a priceless pearl for which we should give our all (cf. yesterday’s Gospel, from Matthew 13:45-46). In Innsbruck, the Premonstratensians (or Norbertines) of Wilten have an unusual set-up: they live in their Stift or monastery and also take care of a large Marian shrine only a stone’s throw away, the Basilika Wilten. 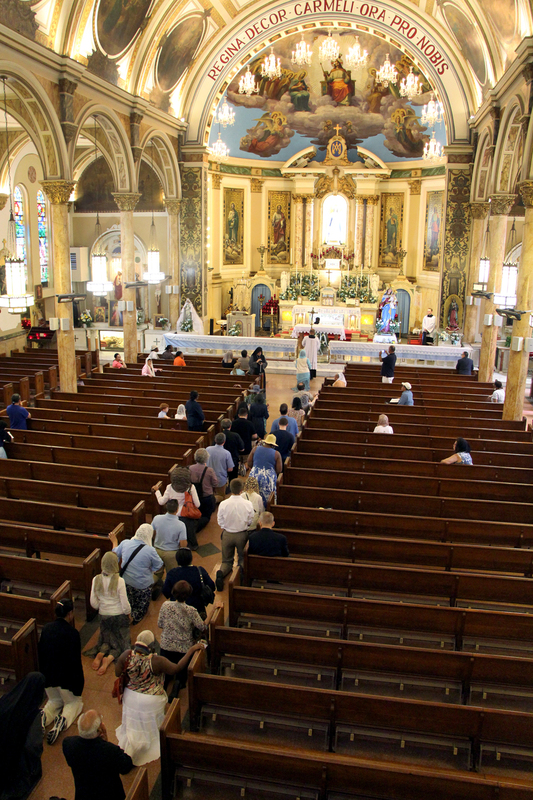 Wilten enjoys the privilege of being the oldest parish in this part of the country, the “mother parish.” The cherished image of Our Lady has attracted pilgrims since the Middle Ages. Today’s Rococo church (1751-1755) is the most important accomplishment of the Tyrolean priest-architect Franz de Paula Penz. In 1957, Pope Pius XII elevated the church to the status of a minor basilica. 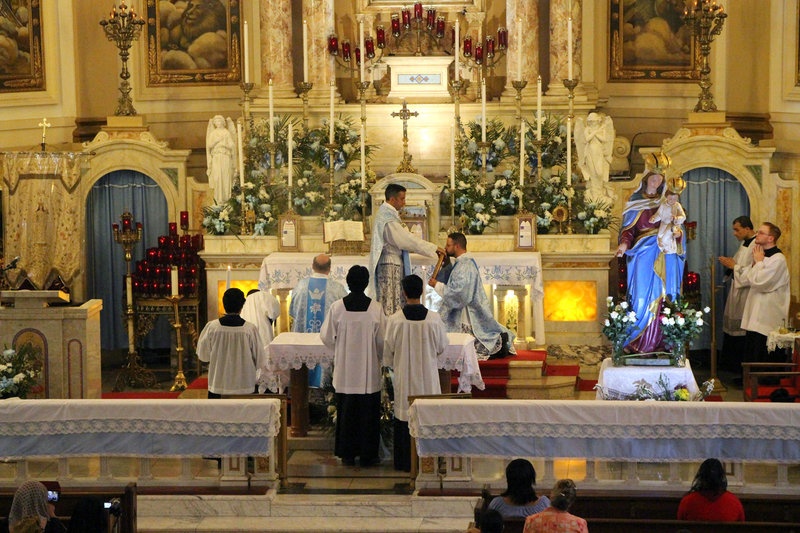 On Thursday, August 4, the traditional Solemnity of Our Holy Father Saint Dominic, there will be a Solemn High Mass in the Dominican Rite in Portland OR. The celebrant will be Fr. Ambrose Sigman, O.P., assisted by Frs. Gabriel Mosher O.P., and Vincent Kelber, O.P., as deacon and subdeacon, and it will take place at the Priory Parish of the Holy Rosary in Portland Oregon, 7:00 to 8:30 p.m. The preacher will be Fr. Augustine Thompson, O.P., S.T.M., professor of history at the Dominican School of Philosophy and Theology, Berkeley CA. The music will be provided by Cantores in Ecclesia under the direction of Blake Applegate. The music for that Mass will be Edmund Rubbra's Missa in Honorem Sancti Dominici, sung by Cantores in Ecclesia, with proper chants from the Dominican Gradual. Cantores will also be singing at another Dominican Rite Solemn Mass for the Feast of the Transfiguration on Sunday, August 6, at 11:00 a,m. Holy Rosary is located at 375 NE Clackamas St, Portland, OR 97232, and there is ample parking. A reception will follow the Mass in Siena Hall. The Society for Catholic Liturgy, an association of Catholic scholars, teachers, pastors and professionals, including architects and musicians, founded in 1995, will hold its annual conference from September 28 - 30, 2017 in Philadelphia, Pennsylvania. 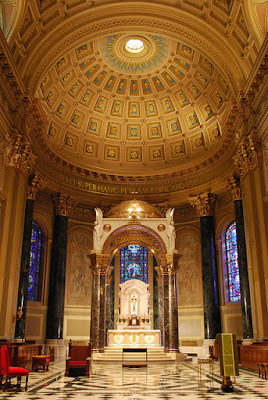 The conference events will be held at the Cathedral Basilica of Saints Peter and Paul, and the Archdiocese of Philadelphia Pastoral Center. A plenary address will be given each day: on September 28 at 7:00 pm by Dom Alcuin Reid; on September 29 at 9:00 am by Father Andrew Menke; and on September 30 at 9:00 am by Father Cassian Folsom, OSB. 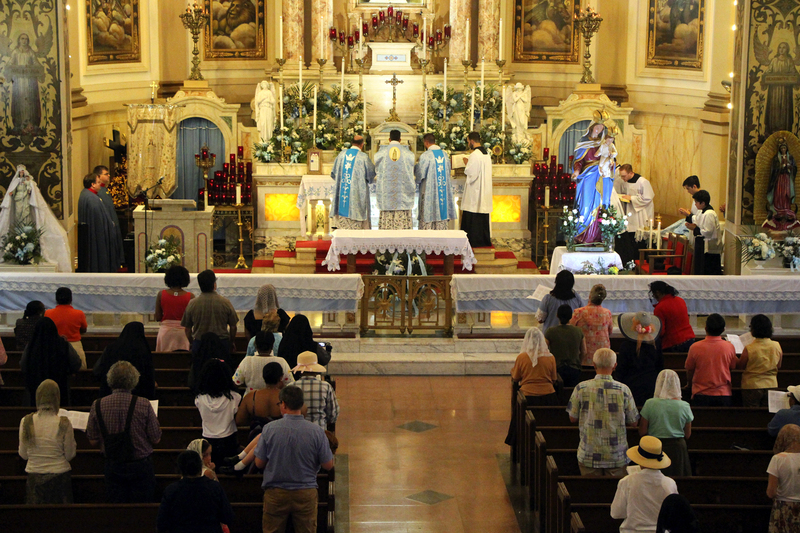 Three main conference Masses will be offered: on September 28 at 6:30 pm; a Solemn Mass in the Extraordinary Form on September 29 at 4:30 pm: and on September 30 at 12:05 pm. On Thursday, August 4, the traditional Solemnity of Our Holy Father Saint Dominic, there will be a Solemn High Mass in the Dominican Rite in Porltand OR. The celebrant will be Fr. Ambrose Sigman, O.P., assisted by Frs. Vincent Kelber, O.P., and Gabriel Mosher, O.P. as deacon and subdeacon, and it will take place at the Priory Parish of the Holy Rosary in Portland Oregon, 7:00 to 8:30 p.m.
with proper chants from the Dominican Gradual. 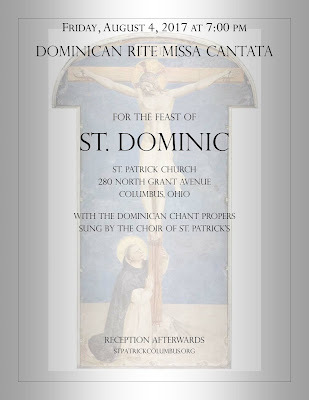 Cantores will also be singing at the usual 11 a.m. Dominican Rite Missa Cantata the following Sunday. This is our annual posting on one of the discrepancies between the traditional arrangement of the Roman Breviary and the new rubrics of 1960; the first such discrepancy appear at Vespers this evening. Previous versions of this post were done to explain the difference in dating the September Ember Days, but this year, they are the same in both systems. One of the changes made to the Breviary in the revision of 1960 regards the arrangement of the months from August to November. The “first Sunday” of each of these months is traditionally that which occurs closest to the first calendar day of the month, even if that day occurs within the end of the previous month. This year, for example, the first Sunday “of August” is actually tomorrow, July 30th, the Sunday closest to the first day of August. In the 1960 revision, however, the first Sunday of the months from August to November is always that which occurs first within the calendar month. According to this system, the first Sunday of August is the 6th this year. This change also accounts for one of the peculiarities of the 1960 Breviary, the fact that November has four weeks, which are called the First, Third, Fourth and Fifth. According to the older calculation, November has five weeks when the fifth of the month is a Sunday, as it is this year. (This is also the arrangement that has the shortest possible Advent of 3 weeks and one day.) According to the newer calculation, November may have three or four weeks, but never five. In order to accommodate the new system, one of the weeks had to be removed; the second week of November was chosen, to maintain the tradition that at least a bit of each of the Prophets would continue to be read in the Breviary. This is the second part of a lecture by Fr Stefano Manelli, the founder of the Franciscan Friars of the Immaculate, originally delivered at the 2nd annual conference of Giovani e Tradizione and Amicizia Sacerdotale Summorum Pontificum, which took place in Rome on October 16-18, 2009. It was published in Italian in the acts of the conference by Fede e Cultura, in the volume “Il motu proprio Summorum Pontificum di SS Benedetto XVI: un grande dono per tutta la Chiesa.” (The motu proprio Summorum Pontificum of His Holiness Pope Benedict XVI: a great gift for the whole Church.) It is reproduced here in an English translation by Mr Zachary Thomas, with permission of the Italian publisher. To read the first part, click here. Certainly the even more profound spiritual motive that binds the religious life to the liturgy is, in particular, the liturgical prayer par excellence: the Holy Mass. The religious state, indeed, following the thought of the spiritual authors of primary importance such as P. Ludovic Colin and Ven. Columba Marmion, has a very particular connection to the Holy Sacrifice of the altar. For every religious, in fact, the three solemn vows signify the ascent of Calvary, and being crucified with Jesus! The religious must go up and surrender himself as one with his crucified Lord, and every time that the sacrifice of the cross is so renewed on the altar, then also he will renew his sacrifice and place himself again on the altar with the Divine Victim. A man accomplishes a sacrifice, a true holocaust, insofar as he is consecrated and devoted totally to God, because in so doing he dies to the world to live in God. This sacrifice, after the Mass and martyrdom, is the most perfect, the most acceptable to God and the most fecund in time and for all eternity. 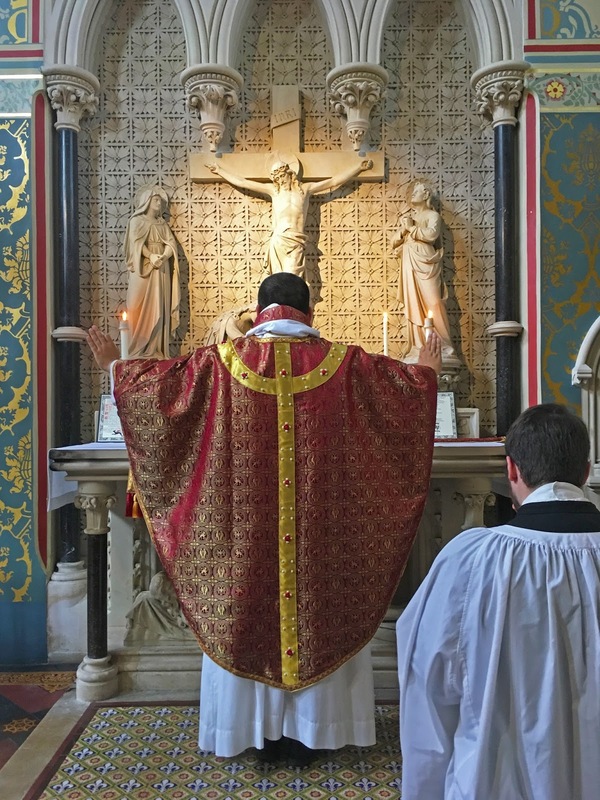 And indeed, in the religious state we discover all the elements constitutive of the sacrifice of the altar, namely: oblation (in the offertory), immolation (at the consecration), consumption of the victim (at communion). Not only does the religious who takes a vow of poverty, of chastity, and of obedience offer himself to God, but the very formula of offering is also an act of consecration, by which comes about, so to speak, the transformation of the Christian into a religious, a spiritual victim and a holy offering. At his profession, the religious truly gives and consecrates himself to divine service; God, by His own will, ratifies and confirms this consecration for all eternity. As has been justly observed, religious profession is at once a work of God and a work of man. We may say that God holds in his hands the soul that offers itself to Him, and blesses it: “Accepit in manus suas et benedixit.” This blessing is not merely a word without meaning, but an act, a work of sanctification and of consecration. And the consecration entails the immolation and the total consumption of the victim. This aspect is more grave and splendid, the fulcrum of the religious state. In fact, the religious is, through his vocation, a being-sacrificed, a living host which is consumed totally in the holocaust of love for the glory of God and for the salvation of souls. For the celebration of the Year of the Priest, our Supreme Pontiff Benedict XVI, wanting side by side with the holy Curé of Ars, who was a model for secular priests, to place also a model of a holy priest for the religious, has selected St. Pio of Pietrelcina, a saint of our times, a Franciscan Cappuccian who was marked with the bloody stigmata for fifty long years of his life, and happily declared by Pope Paul VI “a representative of the stigmata of our Lord Jesus Christ.” He was an extraordinary priest who, especially in the celebration of the Holy Mass, appeared like St. Francis of Assisi to be a true “image of Jesus crucified” (from the Preface of the Mass of St. Francis of Assisi). This is the wisdom of the saints, and the faith speaks in the same way. The Divine Office is worth more than any other work, it is really the work of God par exellence. Others are “opera hominum” (the works of men), while the Divine Office is from God, as a homage of praise that comes down from God through the Incarnate Word, presented to the Church in the name of Christ. The Divine Office can become, and often does for a few, a true sacrifice; and thus it can be called in the fullest sense a “Sacrificium Laudis” (Ps. 49:23). This can happen in various ways: foremost because the recitation of the Office (especially the old Office) follows very precise norms and ceremonies to which one must faithfully adhere. This is what constitutes the penitential aspect of the praise of God. Moreover, it is necessary to impress upon the mind a loving attention to the divine Psalmody, and to that end, repeated efforts are necessary to subdue the appetites and our natural inconstancy. These are all sacrifices acceptable to God. Note: This is the first part of a three-part series. Part Two will examine the preparatory period (1961-1962), and Part Three will look at the first and second sessions of the Council itself (1962-1963). On peut souhaiter, là où c’est possible, si des communautés en font la demande, une harmonisation des calendriers liturgiques. On doit étudier les voies vers une convergence des lectionnaires. Here at NLM, Gregory DiPippo penned an excellent article in response to and in dialogue with other people’s thought and considerations, notably Fr Raymond de Souza in the Catholic Herald (whose follow-up article can be found here). Gregory’s observation—and, to be fair, he is by no means the only one to observe this!—that the integration of one lectionary into the other form is simply impossible without irreparable damage is, in my opinion, quite correct. So, if some sort of “convergence” of the two lectionaries is to happen, it cannot be on done on this basis. A comprehensive examination of their strengths and shortcomings is required—and, for the Ordinary Form lectionary in particular, this will involve a detailed critique of the rationale and work of Group 11 of the Consilium. However, another important part of this study is the following question: what sort of reform did the Council Fathers and the periti envisage? Looking at the liturgy constitution in itself, it would seem difficult to answer this question. On the one hand, “there must be no innovations unless the good of the Church genuinely and certainly requires them; and care must be taken that any new forms adopted should in some way grow organically from forms already existing” (SC 23); on the other hand, the stated desire for some sort of multi-year cycle of readings in SC 51 is an innovation without precedent in the liturgical tradition. 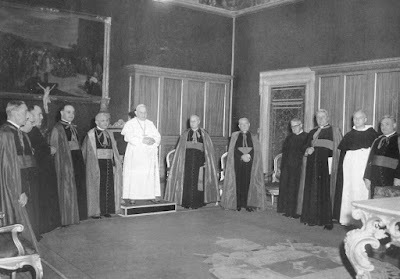 Shortly after the Antepreparatory Commission for the Second Vatican Council was established in May 1959, its President, Domenico Cardinal Tardini, sent a letter to all those entitled to attend the upcoming Council, asking them to submit their views on it and what, in their opinion, ought to be discussed at it. The original deadline for these submissions was September of that same year, but it ended up being extended to the end of April, 1960. These responses, known as vota, were published sub secreto as part of the Acta et Documenta Concilio Oecumenico Vaticano II Apparando, some of which I have already made freely available at NLM. There were over 2,100 vota in total, published in eight large volumes: some vota were very terse and said very little, while others were far more in-depth and wide-ranging. There are a number of interesting features about these vota, but I will make only three brief observations here. First, it is worth noting that only around 70 vota in total are cited by the AC for these 43 propositions. If we count the other vota that mention the lectionary which are not cited in the AC, the total comes to around 125, or just under 5% of those entitled to attend the Council. It does not appear that the question of a possible reform of the lectionary was prominent in the minds of many of the Fathers. Second, with regard to the question of a multi-year cycle, propositions 13-22 reference the vota that were asking for a three or four year cycle of readings, along with those that are less specific (plurium annorum, certo annorum cyclo, etc.). Over these 10 propositions, 20 vota are cited (19 individual, 1 group); if we are to include the vota not cited in this section of the AC, the total rises to 32 (33 if the submission from the Pontifical Salesian University is counted), and in these vota the possibility of a two-year cycle and five-year cycle are also mentioned. So, of the already rather small subset (5%) of the vota that mention lectionary reform, only a quarter of these (so 1.25% of the whole) suggest that a multi-year cycle of readings would be a good idea, and by no means is a three-year cycle unanimously considered the best way to implement this. Finally, there is a heavy emphasis in the vota as a whole on the didactic element of the Mass of the Catechumens; any reform of the lectionary needs to make it easier to teach the faithful about Catholic doctrine and increase their knowledge of the Bible. The latreutic dimension of this part of the Mass is barely mentioned in the vota. We will return to this observation as this series goes on; it will suffice for now to say that this ‘turn to the didactic’ is of a piece with the post-World War II liturgical movement’s suggestions for lectionary reform at the various liturgical congresses and conferences of the 1950s (particularly Maria Laach in 1951 and Lugano in 1953). In conclusion, the evidence of the antepreparatory period would seem to suggest that there was no great desire on the part of the Fathers before the Council for a radical reform of the lectionary. Other issues, such as a limited use of vernacular languages, were far more pressing for them. The next part of this short series will look at the next stage in the work of the Council, the preparatory period. Furthermore, in this author's opinion, it is an open question as to whether or not the specific, practical reforms mentioned in Sacrosanctum Concilium, such as the readings being intra praestitutum annorum spatium in SC 51 or the abolition of Prime in SC 89, should still be part of any potential future liturgical reform. For instance, the proposition “Error communismi damnetur” has nearly 220 vota referenced (see Analyticus conspectus I, 199-200). Peter Kwasniewski has critiqued the obscuring of the latreutic dimension of the Mass lections numerous times here at NLM and elsewhere: for example, “A Tale of Two Lectionaries: Qualitative versus Quantitative Measures” (NLM, 16 Jan 2017); chs. 2 and 8 of Resurgent in the Midst of Crisis (Angelico Press, 2015); and, most recently, ch. 8 of Noble Beauty, Transcendent Holiness: Why the Modern Age Needs the Mass of Ages (Angelico Press, 2017). 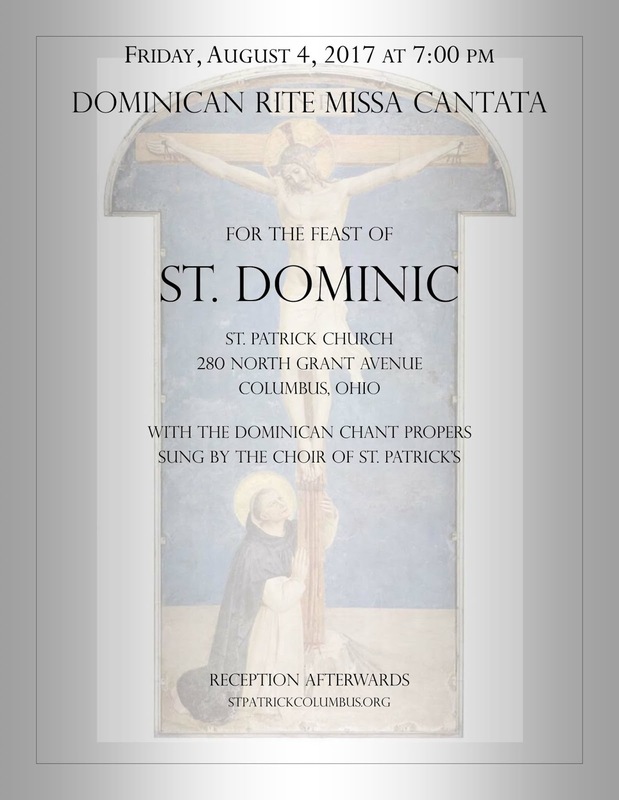 On Friday, August 4, the feast of St Dominic, the Friars of St Patrick Church will offer a Missa Cantata in the Dominican Rite, starting at 7 pm. The Dominican chant propers will be sung by the choir of St Patrick’s under the direction of Kathleen Tully. The church is located at 280 North Grant Avenue in downtown Columbus; parking is available behind the building. After Mass there will be a reception with light refreshments in Patrick Hall. A new director has been appointed for the Benedict XVI Institute for Sacred Music and Divine Worship, which is based at the seminary of the Archdiocese of San Francisco in Menlo Park and was founded under the patronage of Archibishop Cordileone. Maggie Gallagher, a senior fellow at the Washington, D.C.-based American Principles Project, graduated from Yale University in 1982 with a bachelor’s degree in religious studies; she has been published in The Wall Street Journal and The New York Times and written several books. She is the founder and former president of the Institute for Marriage and Public Policy, a nonprofit organization focused on research and public education on marriage and family law. The institute will also promote the work of Benedictine Father Samuel Weber, someone well known to NLM readers, who teaches at the seminary and is known for his Gregorian chant compositions. This is a positive development which suggests to me that there is an intention to evangelize the culture and have a wider impact beyond the archdiocese itself. 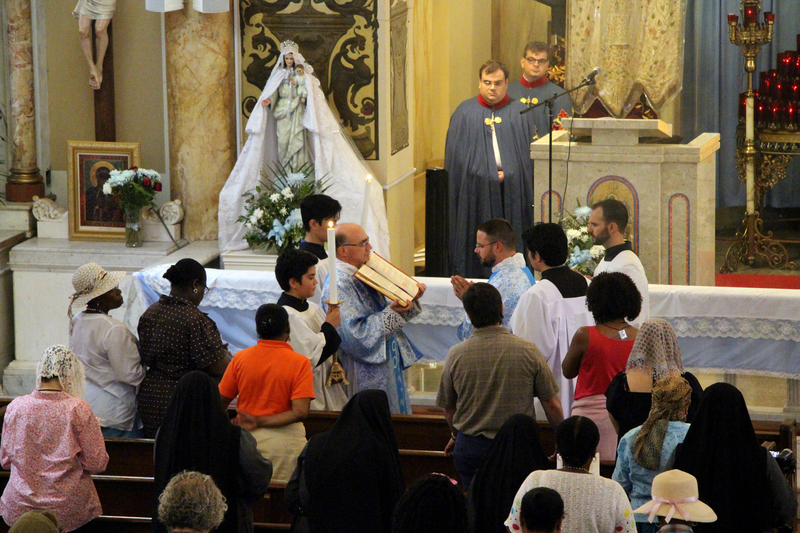 On Saturday, July 22, the 6th Annual Traditional Mass Pilgrimage was held at the Pontifical Shrine of Our Lady of Mt. Carmel in New York City. Here are some photos by one of our regular photopost contributors, Diana Yuan. The penitential procession of pilgrims on knees or discalced. The following lecture by Fr Stefano Manelli, the founder of the Franciscan Friars of the Immaculate, was originally delivered at the 2nd annual conference of Giovani e Tradizione and Amicizia Sacerdotale Summorum Pontificum, which took place in Rome on October 16-18, 2009. It was published in Italian in the acts of the conference by Fede e Cultura, in the volume “Il motu proprio Summorum Pontificum di SS Benedetto XVI: un grande dono per tutta la Chiesa.” (The motu proprio Summorum Pontificum of His Holiness Pope Benedict XVI: a great gift for the whole Church.) It is reproduced here in an English translation by Mr Zachary Thomas, with permission of the Italian publisher. Through the knowledge imparted in Divine Revelation, we have access to the pure waters of that unique fountain of Sacred Scripture, welling up like a great river of perennial tradition and running along through the centuries and millennia of the life of the Church: a perennial tradition expressed in a wonderful manner especially by the Fathers of the Church. 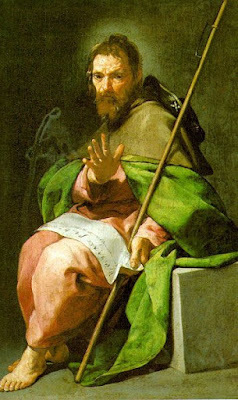 Among these Church Fathers, Saint Ambrose writes in his Hexameron: “The Church, like the moon, goes through frequent waning and waxing, but it is precisely by virtue of its waning that it grows and becomes deserving of greater fullness…The Church shines not with a light of its own but with the light of Christ, and draws its splendor from the Sun of justice” (IV, 32). To speak about the image and the reality of the moon as applied to the Church is really something unknown to modern Christianity, and it might even sound like irreverence to look upon Her as the supreme light that illumines the world. But the saintly Bishop of Milan, with his insightful and surprising speech helps us to understand the ecclesial mystery more profoundly. We can draw two considerations from his thinking. The Church does not shine with its own light, but, like the moon, reflects the splendors of the crucified and resurrected Lord. A Church that no longer reflects the light of its Founder would no longer be His Church, but another’s. The “lunacity” of the Church, an expression used by Card. Biffi, should not astonish us. With an insight that is both direct and tender, Anselm writes that the Church is “ex maculatis immaculata;” She is without stain, though composed of sinful men. This Church, which is never without sinners, is always without sin in herself. In her human structure, therefore, she cannot be otherwise than “moonlike,” since she reflects the fragility and debility of fallen humanity on the road to the kingdom of Heaven. Mindful of the words and thought of the saintly Archbishop of Milan, we turn our attention now to the ecclesial reality in which we live. First, it is not at all difficult to admit that in our time the splendor of the Bride of Christ is going through an eclipse of perhaps unique proportions in its bi-millenial history. This crisis, which entirely encompasses the whole life of the Bride of Christ, according to the Holy Father Benedict XVI, “depends in large part on the collapse of the liturgy” that came not in the Council, but in the post-conciliar period. Such words, taken up again in another of his writings, extend even beyond the limits of the Church to constitute a fundamental element of all life and of the human sphere: “What is right and what is moral do not remain the same,” the Pope also writes, “as long as they are not anchored in their liturgical center and do not draw their inspiration from it […]. Only if our relationship with God is just will all the other relations of man – those of men with themselves and of man with the rest of created reality—be able to function”. But where, in general, does the basis of this influence of the liturgical cult on human life reside? With worlds of heavenly light, Cardinal Ratzinger responds in what immediately follows the cited text: “Adoration, the correct modality of cult, of man’s relationship with God, is constitutive of correct human existence in the world: this is for the very reason that in the midst of daily life it makes us participants of the mode of existence of heaven, God’s world, thereby letting the light of the divine world penetrate into our own […]. [Cult] prefigures a more definitive life, and in so doing gives to the present life its proper measure. A life bereft of such anticipation, into which heaven is not at all sketched, would become leaden and empty”. The reliquary of St James the Apostle, made in the 15th century; it also contains relics of Maria Salome, traditionally identified as his mother, St Martin of Tour, and two local early martyrs, priests named Rufinus and Felix. The relic was formerly kept in a special chapel gated off from the rest of the church at the back of the right nave; this chapel was the property of the city, and under its jurisdiction, not of the cathedral and its bishop and canons. The city’s governing council held its meetings in it, as a sign of the Apostle’s protection and patronage, and its constitution was kept in the small safe-room which also stored its precious objects. Between 1287 and 1456, the chapel’s altar was commissioned in different stages. The various parts of it have been dismantled, reassembled and reordered on several occasions; during the Second World War, it was taken apart and removed to a deposit for safe-keeping. and afterwards reassembled. The current arrangement dates from the year 1953. Since the panels are made of silver, it is now kept behind rather thick glass to prevent people from touching them, which makes a certain amount of lens flare unavoidable. Several parts of this upper panel were originally a frontal. Two of the figures were stolen and never recovered; this is why the figures which were inserted in the niches to either side of St James’ head to replace them are slightly too large. St James with a pilgrim’s hat and staff. The panels of the frontal have also been rearranged. The upper register shows the Annunciation and Visitation, the Birth of Christ, Christ in majesty between the Virgin and St James, the arrival of the Magi, and their adoration of the Christ Child. The middle register shows King Herod ordering the Massacre of the Holy Innocents, the arrest of Christ, the Crucifixion, the Angel’s appearance to the Three Marys at the tomb, and Christ’s with St Thomas. The lower register sows the Ascension, the Presentation in the Temple, and the Sermon on the Mount, followed by the condemnation and beheading of St James. I wrote recently about some ideas for guiding principles by which we might create a canon of art for Roman Rite churches, and a schema that would guide the placement of such images in a church. I now plan on a series of articles describing the key elements of images of the saints of the Roman Canon - Eucharistic Prayer I - and the major feasts of the year. My hope is that it may stimulate interest in some of you to realize such schemes of art in your church. 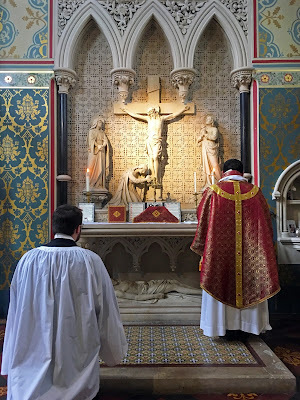 As I say in the article linked above, the goal is also to engender a manner of worship in which the faithful engage fruitfully with holy images while participating in the liturgy. This is quite a big project, and so I don’t expect to do the whole thing in the course of one year. I don’t know if I have the time to do the research and writing for the complete set in that time, but I will do the best I can. 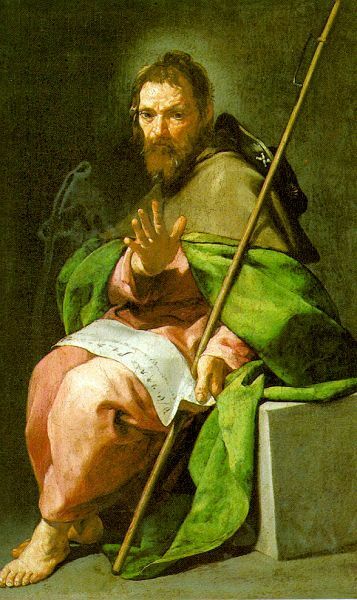 I am heartened by the fact that even for our own Shawn Tribe, who for many years was tireless in posting several times a day on this site, two years elapsed between his feature The Saints of the Roman Canon, Part 1 and its reprise The Saints of the Roman Canon, Part 2! My general plan is to cover the Saints first, and then the feasts, but I always go where my curiosity takes me, so I will throw in a great feast from time to time in this first year. I have created the tag “Canon of Art for the Roman Rite”, so that should any be interested, they can access the accumulating body of articles at any time. Today, July 25th, is the feast of St James the Greater, the Son of Zebedee. The images of St James are simple, and it would not always be easy to recognise him - except that in order to be worthy of veneration, the name of the saint should appear on or beside every image! 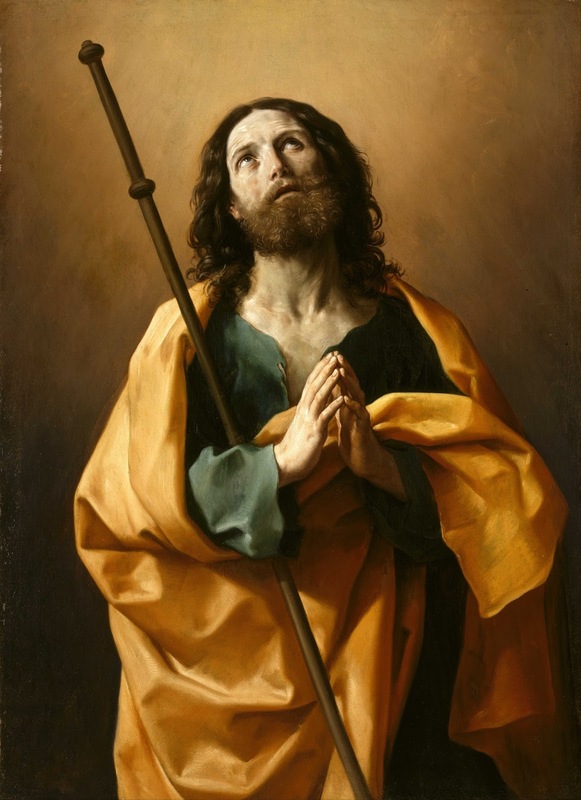 In traditional iconography, he is depicted bearded with short, brown curly hair. He was martyred only 10 years after the Resurrection, and is ordinarily not seen with grey hair to indicate that he did not live to old age. He holds a scroll, which is an indication of divine wisdom. In Western images, the equivalent might be also the holding of a book. The icon below is from the late 18th century. 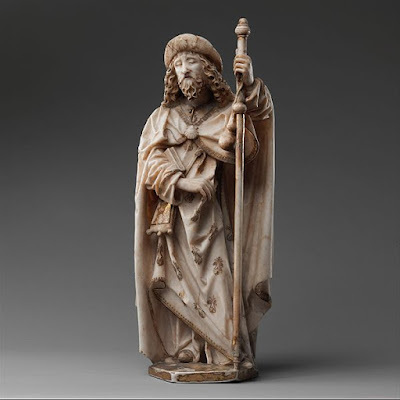 In Western images, he is often depicted with longer hair, still usually brown and curly, and holding a pilgrim’s staff, a reference to the tradition that he is buried at Santiago de Compostela. This is, of course, still a very important pilgrimage site to this day, and many people every year follow all or part of the Way of St James from France to the final destination in Spain. 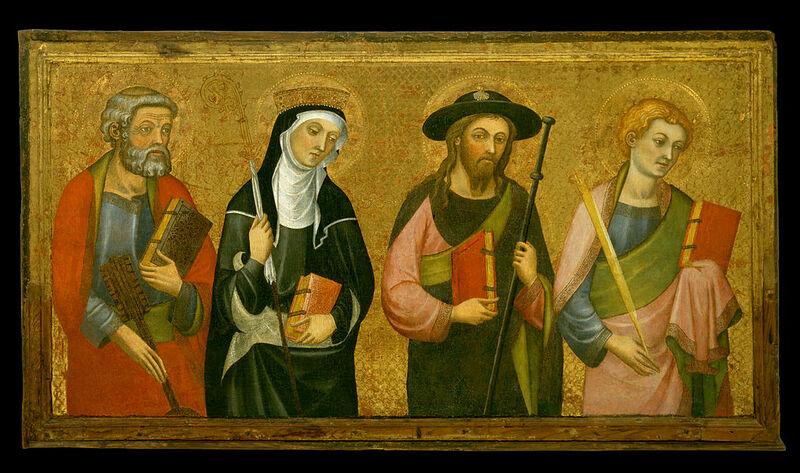 Here is a 14th century depiction by Pere Serra, who lived and worked in Cataloniam with Ss Peter, Clare, James, and John the Evangelist. A contemporary painting by the Spanish baroque master, Alonso Cano. And a 15th century Spanish statuette in stone. For the fullest presentation of the principles of sacred art for the liturgy, take the Master’s of Sacred Arts at www.Pontifex.University. 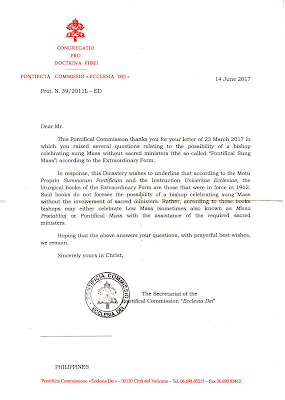 In response to a query from the Cappella Gregoriana Sanctae Cæciliae, a traditional rite choir based in the Philippines, the Pontifical Commission Ecclesia Dei has issued a clarification on the subject of the so-called Pontifical Sung Mass. 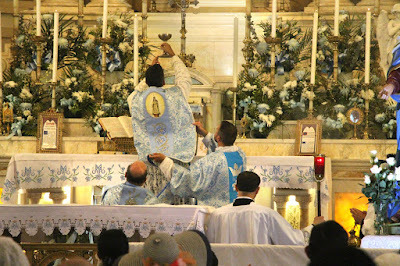 The historical custom of the Church has been that a bishop may celebrate either a Low Mass of the type known as a missa praelatitia, or a full solemn High Pontifical Mass, attended by an assistant priest, deacon, subdeacon, the requisite minor ministers, and of course a choir; there was no provision for a bishop to sing Mass without the major ministers, analogous to the priest’s Missa cantata. The first permission for a bishop’s sung Mass was given by the decree Inter oecumenici, which was issued on September 26, 1964, and became legally active on March 7 of the following year. 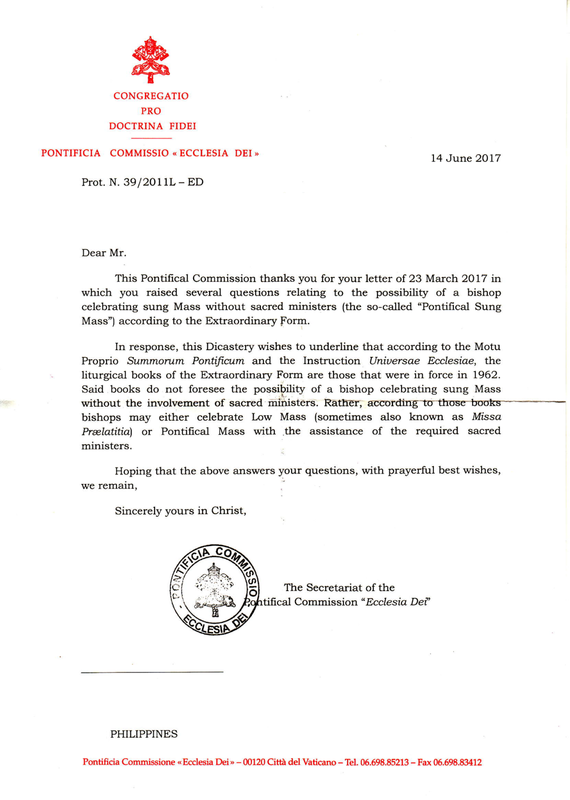 This decree states simply that “It is allowed, when necessary, for bishops to celebrate a sung Mass following the form used by priests.” Wholly in keeping with that era’s nascent liturgical chaos, it says nothing about which, if any, ceremonies of the Pontifical Mass are to be retained, or whether the bishop is to simply pretend to not be a bishop when exercising the fullness of the priesthood vested in him as a successor of the Apostles. In the old city of Innsbruck one finds the rather impressive Jesuit church dedicated to the Most Holy Trinity, adjacent to the Theology Faculty. This is and has long been a major center for Jesuit studies. Card. 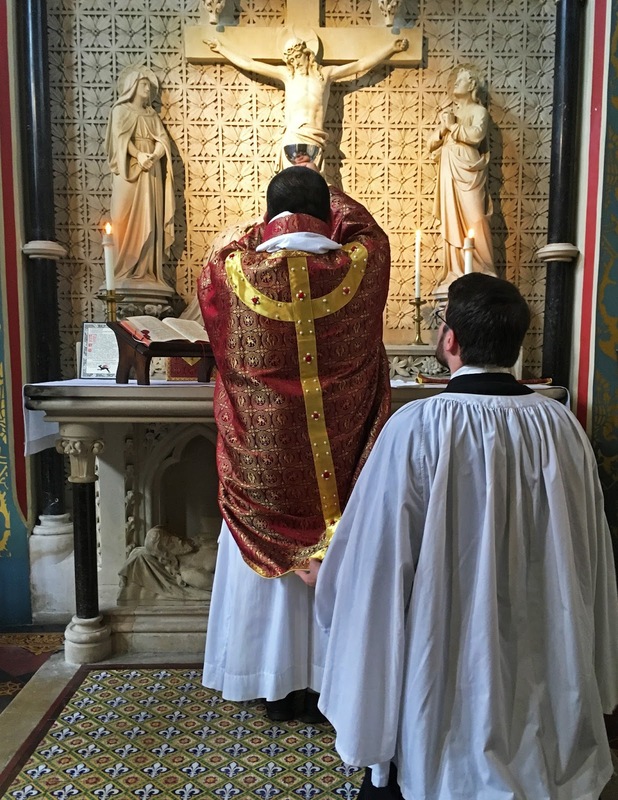 Robert Sarah, prefect of the Congregation for Divine Worship, recently had an article in the French magazine La Nef; in it, he discusses among other things the mutual enrichment of the two Forms of the Roman Rite which Pope Benedict proposed in the motu proprio Summorum Pontificum. The text has not yet been made available on their website, but someone provided Fr Zuhlsdorf with an English translation, which he reads (with an introduction) in a podcast posted here. Reconciliation means movement from both “clans”, as it were. That is likely to encounter opposition from some, perhaps many, traditionalist quarters. That poses a twofold challenge. First, it requires the EF community to acknowledge that some aspects of the OF, particularly its reformed calendar and its lectionary – which includes far more Scripture than the EF one – are actual improvements and possible enrichments for the EF. For example, EF devotees often speak about the simplified OF calendar as being too banal – “Ordinary Time” instead of Sundays after Pentecost – and consider it a mistake to have abandoned Passiontide and the octave of Pentecost. They are right about that, but thinning out the number of feast days of obscure saints and incorporating the more recently canonised is more controversial. A shared lectionary would require a shared Sunday calendar at least, which could not be achieved without significant changes in both the current EF and OF calendars. And while there is wide consensus that the OF lectionary is superior, it is not universal, and any move towards it would encounter stiff opposition. Sarah knows of such positions, and warns us against treating the EF as a “museum object” locked forever in 1962. The gist of this, therefore, is that the much of the discussion of “mutual enrichment” has really been about unilateral enrichment, the idea that the customs of the EF can obviously enrich the OF in a variety of ways, (he specifically cites ad orientem celebration, greater use of Latin, and more silence, a subject near and dear to His Eminence’s heart) but that the OF brings little or nothing to the table for enrichment of the EF. The challenge to traditionalists would therefore be to accept certain aspects of the OF that can indeed enrich the EF. (Card. Sarah’s) reasons are confusing, but his proposals are unworkable. … (he) explains: ‘ “Reform of the reform” has become synonymous with dominance of one clan over the other.’ He prefers the phrase ‘liturgical reconciliation’. The ‘Reform of the Reform’ is a movement among practitioners of the Ordinary Form, who argue over Latin, chant, the direction of worship, altar girls, and so on. It is one of the advantages of the Extraordinary Form that we don’t have to get into these battles. Cardinal Sarah, however, seems to want to solve the endless squabbling by bringing the older Mass into the equation as well. 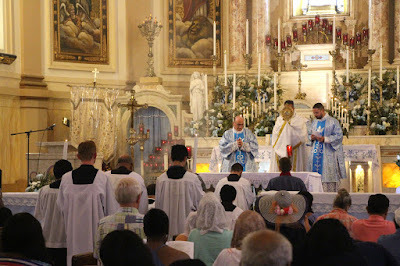 In consideration of the calendar, an important distinction must first be made, one which Fr de Souza blurs in talking about the octave of Pentecost and “obscure Saints” at the same time. Both Forms of the Roman Rite have within them two calendars, the Temporal and the Sanctoral. The difference between the two calendars of Saints is far less important than the difference between the two Temporal cycles. The Church has always had varying calendars of the Saints; as I noted in this article from 2011, after Pope St Pius X’s Breviary reform, which also affected local calendars in many regards, St Peter’s Basilica still kept almost sixty feasts which were not on the General Calendar of the Roman Rite. The Temporal cycle, on the other hand, was one of the stablest parts of the Roman Rite throughout its long and varied history. There are few notable differences between the features of it attested in the oldest Roman lectionaries and sacramentaries in the seventh and eighth centuries, and that of the Missal of St Pius V; those which do exist consist almost entirely of the addition of feasts such as Corpus Christi. 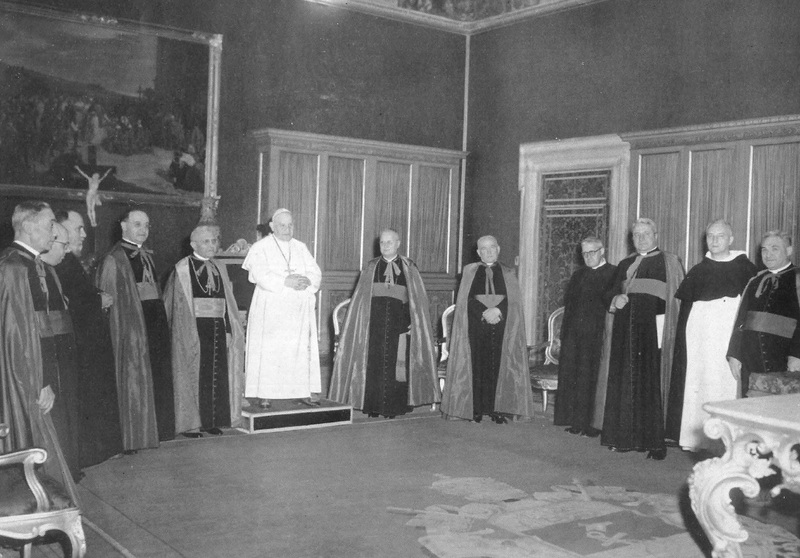 It hardly needs repeating that the fathers of Vatican II did not in any way ask for or envision the drastic mutilation of the Temporal perpetrated by the post-Conciliar reformers. I also cannot imagine why Fr de Souza writes that “there is wide consensus that the OF lectionary is superior,” when almost every feature of it has been argued against and contested from every point of view. The new lectionary’s creators were thoroughly convinced that they were restoring an ancient custom of the Roman Rite when they introduced the three-reading system for Sundays and solemnities; this is now known to be completely untenable. Many years ago, I attended a lecture by the grand doyen of liberal Biblical scholars, Fr Raymond Brown, on the Epistles of St Paul. He pointed out that in Ordinary Time, the first reading is chosen in relation to the Gospel, while the Epistles run between them in broadly canonical order, and are not chosen in reference to them; the new lectionary therefore almost guarantees that priests will rarely preach on the writings of St Paul. Even if one regards the new calendar and lectionary as unmitigated triumphs in every way, we simply cannot dismiss as mere partisanship the question of why the phrase “Reform of the Reform” came into existence in the first place. Pope Benedict XVI himself famously described the current state of the liturgy as a “sad ruin,” compared both to what it had been before the Council, and what the most recent ecumenical Council wanted it to be. A great deal of progress has been made to improving the liturgy, but much of it by way of eliminating abuses which ought never to have been inflicted on the faithful in the first place, much less tolerated for a single day. Exemplary celebrations of the OF Mass, such as those of St Agnes in Minneapolis-St Paul or the London Oratory, are extremely rare. It is pointless to deny that many bishops and religious superiors would not tolerate attempts by their clergy to emulate the practices of such churches. Whole nations remain untouched by this progress; model celebrations of the Ordinary Form of the Mass remain vanishingly rare in Italy, for example. Fortunately, when Pope Benedict called for “mutual enrichment” of the two Forms, he established no criteria for determining the conditions under which it might take place. I hazard to suggest two such conditions. One would be to put the OF house in order by purging out its many scholarly falsehoods, and deleterious practices like allowing the celebrant to choose the Eucharistic prayer. The other would be to clock in a couple of centuries in which even a substantial minority of the faithful can attend a Mass celebrated according to the mind of the Fathers of Vatican II. 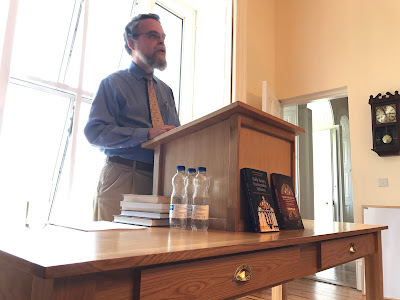 At the kind invitation of Dom Mark Kirby, O.S.B., I delivered a lecture this past Tuesday, July 18, at Silverstream Priory in Ireland, entitled "Liturgical Obedience, the Imitation of Christ, and the Seductions of Autonomy." The full audio with Q&A may be found here (the lecture is about 45 minutes, and the Q&A 17 minutes). The devil knows he cannot prevent some advancement of the Christian faith, but he is well aware that nothing comes close to the liturgy’s power for hallowing the Name of God and establishing His kingdom in our midst, giving us our daily nourishment, and moving us to the forgiveness of sins and the avoidance of sins. In truth, liturgy is an end in itself because it is God’s peculiar possession and makes us His peculiar possession. If the devil can convince us that liturgy is not an end in itself, but rather, that it is a helpful tool we should manipulate for ulterior ends, then he has already won half the battle for souls. He has shaken our fundamental orientation to the heavenly Jerusalem and the kingdom that will have no end. One of the great strengths of the traditional Latin liturgy is that it leaves nothing to the will or imagination of the priest (and the same may be said of every minister in the sanctuary). It choreographs his moves, dictates his words, shapes his mind and heart to itself, to make it utterly clear that it is Christ who is acting in and through him. In the words of the Psalmist: “Know ye that the Lord he is God: he made us, and not we ourselves. We are his people and the sheep of his pasture” (Psa 99:3). Sheep are to follow the lead of their shepherd. The clergy is not and will never be the first principle of the liturgy; as St. Thomas Aquinas says with sobering humility, the priest or other cleric is an “animate instrument” of the Eternal High Priest: “Holy orders does not constitute a principal agent, but a minister and a certain instrument of divine operation.” Ministers are like rational hammers or chisels or saws, by which a greater artisan will accomplish His work of sanctification, while conferring on them the immense dignity of resting in His hand and partaking of His action. [...] The clergy are privileged tools, to be sure, but they are still tools; and the liturgy remains the work of Christ, the High Craftsman, the carpenter of the ark of the covenant, the architect of the heavenly Jerusalem, the New Song and its cantor. In its external form, in text and music and ceremonial, the liturgy should luminously proclaim that it is the work of Christ and His Church, not the product of a charismatic individual or a grassroots community. [S]ince free choice is antithetical to liturgy as a fixed ritual received from our forebears and handed down faithfully to our successors, choice tends rather to be a principle of distraction, dilution, or dissolution in the liturgy than of its well-being. The same critique may be given of all of the ways in which the new liturgy permits the celebrant an indeterminate freedom of speech, bodily bearing, and movement. Such voluntarism strikes at the very essence of liturgy, which is a public, objective, formal, solemn, and common prayer, in which all Christians are equally participants, even when they are performing irreducibly distinct acts. 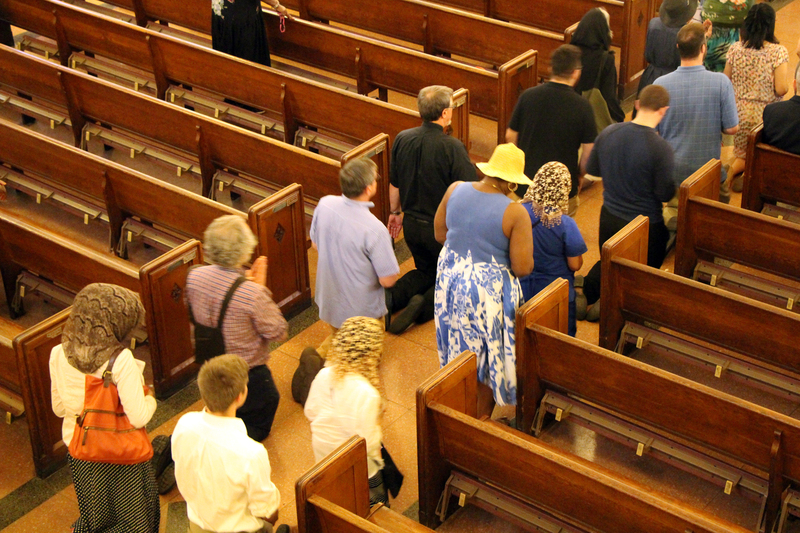 The prayer of Christians belongs to everyone in common, which means it cannot belong to anyone in particular. The moment a priest invents something that is not common, he sets himself up as a clerical overlord vis-à-vis the people, who must now submit not to a rule of Christ and the Church, but to the arbitrary rule of this individual. Go to this link to listen to or download the audio of the entire lecture. The celebrations for the tenth anniversary of the motu proprio Summorum Pontificum are an initiative of the Coetus Internationalis Summorum Pontificum, the organizers since 2012 of the annual Populus Summorum Pontificum international pilgrimage to Rome, of Giovani e Tradizione (Youth and Tradition) and Amicizia Sacerdotale Summorum Pontificum (Priestly Friends of Summorum Pontificum). On Thursday, September 14, Giovani e Tradizione and Amicizia Sacerdotale Summorum Pontificum will organize their fifth colloquium on the motu proprio Summorum Pontificum of Pope Benedict XVI; the first of which took place in 2008. This year’s will be entitled “A Renewed Youthfulness for the Whole Church” and will be held at the Pontifical University of St. Thomas Aquinas, better known as the Angelicum. Among the speakers are announced Cardinal Müller and Cardinal Sarah, Dom Pateau, Martin Mosebach and Ettore Gotti Tedeschi. On the evening of Thursday, September 14, at the conclusion of the colloquium and to celebrate the opening of the pilgrimage, His Excellency Georg Gänswein, Prefect of the Pontifical Household, will celebrate Vespers in the Basilica of St Mark in the Piazza Venezia. Here is the official program of this important event, which will culminate on Saturday, September 16, with a solemn procession through the streets of Rome, led by His Excellency Archbishop Guido Pozzo, Secretary of the Pontifical Commission Ecclesia Dei, and a Pontifical Mass celebrated by His Eminence Carlo Cardinal Caffara, in St Peter’s Basilica at 12 noon. We note that, in gratitude to Pope Benedict XVI, Maestro Aurelio Porfiri, Cardinal Bartolucci’s pupil, will direct a Mass especially composed for this occasion. A few years ago, Shawn Tribe published an article about the presence of Saints of the Old Testament in the Eastern liturgies, and their almost total absence from those of the West. Although a large number of Old Testament Saints are mentioned in the Martyrology, the Seven Maccabee Brothers are the only ones on the traditional Roman Calendar, and their feast was suppressed in the new rite, despite its great antiquity. A number of churches in Venice, a city always marked by strong Greek influences, are dedicated to Saints of the Old Testament, such as San Moisè and San Giobbe. 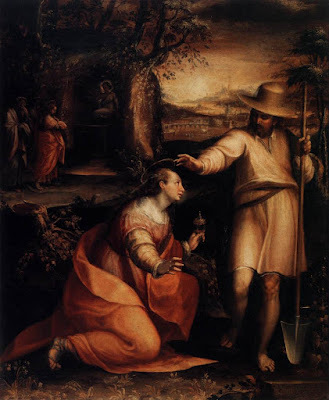 (Moses and Job) The most prominent exception to this absence, however, is the celebration of the Prophets Elijah and Elisha as the founders and patriarchs of the two Carmelite Orders. Of these the former has his feast day on July 20th, the latter on June 14th, the same days on which they are observed in the Byzantine Rite. Seen above is the central panel of the altarpiece painted by Pietro Lorenzetti (ca. 1280 - 1347) for the Carmelite church of his native city of Siena, San Niccolò del Carmine. The altarpiece is now dismembered and removed from its original frame; most of the surviving pieces are in the National Gallery of Siena, but the two narrower panels originally on either side of the central one are in the Norton Simon Museum in Pasadena, California, and a smaller piece from the top is at Yale University. To the left of the Virgin stands St Nicholas, to whom the church is dedicated; to the right is the prophet Elijah. On the scroll in his hands are written the words which he speaks in 3 Kings 18, 19: “Nevertheless send now, and gather unto me all Israel, unto Mount Carmel, and the prophets of Baal four hundred and fifty.” The Carmelites have traditionally honored the prophet Elijah and his disciple Elisha as their founders; in the liturgical books of both the Old Observance and the Discalced, they are each given the title “Our Father”, as is St Dominic in the Dominican Use, St Benedict in the Monastic Use, etc. Both orders also add the name of Elijah to the Confiteor, the Discalced even before that of St Theresa of Avila. Their feasts were kept with octaves, a traditional privilege of patronal feasts, even before an octave was given to the feast of Our Lady of Mount Carmel on July 16th. The tradition behind this is recorded in the lessons of the Roman Breviary for that day, with the cautionary parenthetical note “ut fertur – as the story goes” added at the beginning. In the Books of Kings, there are several references to a group of holy men called “the sons of the prophets”. They foretell to Elisha that Elijah is to be taken away by the Lord, although Elisha already knows this, and afterwards bear witness that “the spirit of Elijah resteth upon Elisha,” who then works several miracles on their behalf. The traditional Carmelite legend claims that a group of men dedicated to God remained on Mount Carmel until the days of the New Testament, when they were “prepared by the preaching of John the Baptist for the coming of Christ”, and “at once embraced the faith of the Gospel.” They are also said to be the first Christians to build a chapel in honor of the Virgin Mary, on the very spot on Mount Carmel where Elijah had seen the “little cloud”, understood as a symbol of the Virgin Mary. Even for an age in which the veneration of the Virgin Mary may truly be described as omnipresent, the city of Siena stood out as a place of particular devotion to Her. In 1260, before the crucial battle of Montaperti, the city placed herself by a special vow under the protection of the Virgin, and proceeded to heavily defeat her long-time rival Florence, whose army was nearly twice as large as her own. 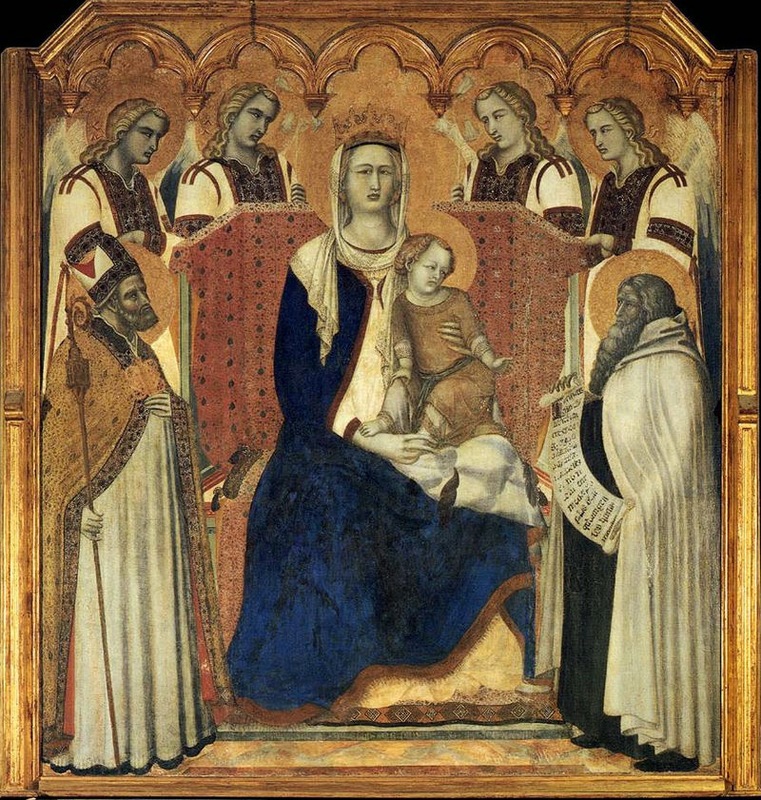 Both the cathedral and the city hall were prominently decorated with famous paintings of the Virgin enthroned, of the type known as a “Maestà”; the former had that of Duccio di Buoninsegna, commissioned less than twenty years before Lorenzetti’s Carmelite altarpiece, and the latter that of Simone Martini from just twelve years before. When Lorenzetti’s work was finished, the mendicant Carmelites could not afford to pay for it, and so the artist’s fee was provided by the city itself. Despite all this, the panels at the bottom of the altarpiece are not dedicated to the principal subject of the main panel, as they would normally be, but rather to the prophet Elijah. 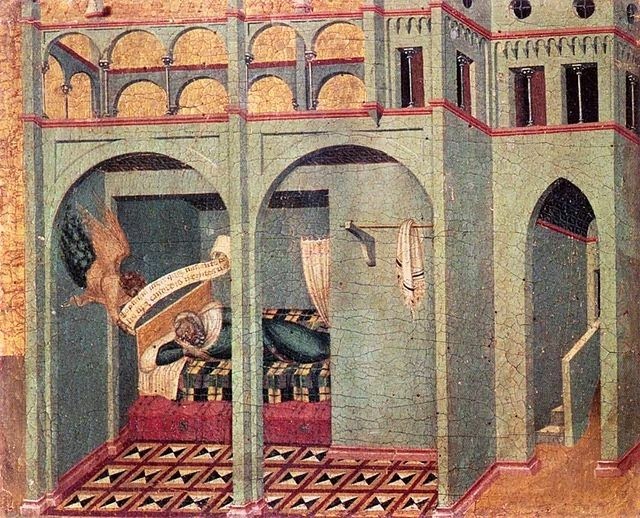 In the first, an angel appears to his father, with a prophecy of his son’s future greatness, just as an angel would later appear to the father of St John the Baptist. 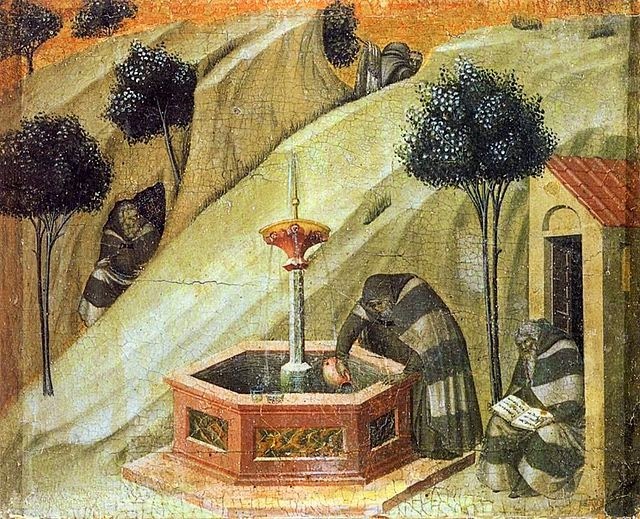 In the second, we see hermits in the desert around a fountain, which was said to have been built for them by Elijah. These would be the spiritual ancestors of the Carmelite Order, men who lived as monks in the Greek tradition in the Holy Land, before being organized under a rule during the period of the Crusader kingdoms. The striped mantle which they are wearing is part of the habit worn by the Carmelites when they still lived in the Holy Land; because of it they were often called in Latin “fratres barrati – barred friars”, or “fratres virgulati – striped friars.” A tradition of the medieval Carmelites held that these stripes represented the tracks of the chariot that took Elijah into heaven, and had been inherited as part of their habit from Elisha. When the Carmelites were forced to abandon the Holy Land at the fall of the Latin kingdoms, they brought their traditions, including the habit, with them to Western Europe, where the striped mantle was considered completely outlandish for religious of any kind, but especially for medicants. Many of the universities refused to admit them dressed that way; hence, the decision of a general chapter held at Montpelier in 1287 to replace it with the white mantle still worn to this day. 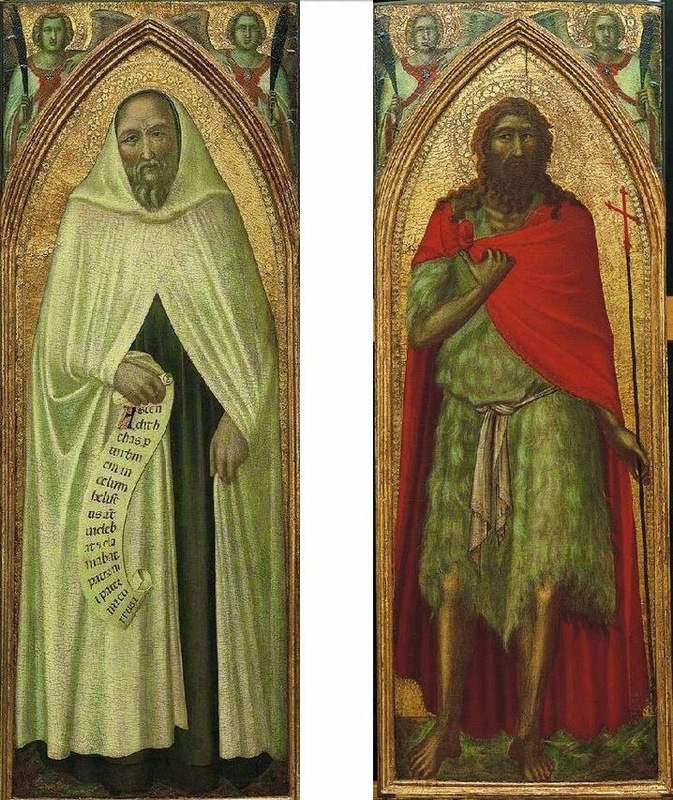 This was a matter of some controversy within the order at the time, and the prophets are shown by Lorenzetti in the “new” habit probably as a gesture to persuade the friars to accept it.